General musings related to nothing in particular. DC + NYC Photo Book Available Now! 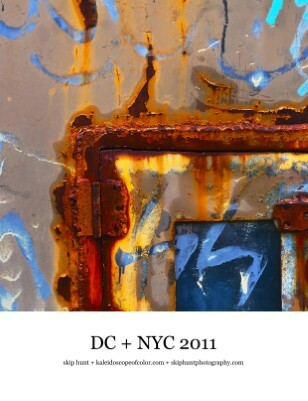 Happy to announce the DC + NYC 2011 photo collection is now live available for preview and purchase! This book is printed by MagCloud and they do a beautifuly job on state of the art printers. This book contains all 60 images from the collection and is perfect bound. You can also preview the entire book before you purchase either the printed version or the digitalversion. The digital verson is included free with purchase of the printed version. Took off on a last minute trip to wander around the Washington, D.C. area and then ended up meandering off to N.Y.C. to continue riding the vivid inspiration you can get while traveling. These images were the result. Fresh New Color & Textural Joy! "Strange Bird" ~ South Padre Island, Texas © 2012 Skip HuntI've been working on a new collection of image compositions based on complex blends and it's called "LithoFusion". As an experiment to see if a subtle series cohesion could be achieved by using certain self-imposed parameters and guidelines. At first I thought from all the carnival booths flowers and taxis decorated with balloons and streamers that someone important was getting married. So, I just hung around and made a few images here and there of the magnificent color cache before me. What I really love about this collection is the elegant way the Seven Days In designers have presented them. Skip Hunt Calendar Catalog Just Grew By 7! 7 New Skip Hunt Calendar CollectionsVery happy to announce 7 brand new calendar collections added. Now at 37 different collections! I've seen these printed and they're gorgeous. Unlike many calendars, you can also pick the month you want the calendar to start. Now Available for Preview and Purchase on MagCloud! Several years ago I was trying to make a point that it really doesn't matter which camera you use and that what mattered most was your own vision. In an attempt to prove this (partly for myself) I set out to do a small collection of images with my old Motorola cell phone. The results made the point I wanted, but the lower resolution became somewhere restrictive. "Calypso" ~ Veracruz, MX © 2011 Skip Hunt (from Mexico 2011 Winter)When the iPhone came out, I couldn't wait to take it for a spin and after loading one up with apps, I took it along to make images to illustrate a motorcycle trip through the Southwest toward California from Texas. It was actually the 3rd generation iPhone 3G that got me started, and I mostly took it for an easy way to upload images live from the road. Code good for $50 off thru 1/1/12 on entire gallery! "My Pretty" ~ Washington, D.C. © 2011 Skip HuntGood news! I've added dozens of brand new images from recent travel's and am offering $50 Off on all orders for a very limited time! This promotion is the best one I've ever offered and is good through 1/1/12! Click HERE to visit my online print gallery. Over 1000 images are eligible for this discount! "May you have warmth in your igloo, oil in your lamp, and peace in your heart!" Now THIS is a "Cat Woman"!!! This video is such an adrenalin rush to watch. Simply incredible control of one's own fear and absolute mind focus. 1:31 If I kneel down, they will come towards me because I’m the same size as them. 1:50 I do this to show you how cowardly they are, not to tease them, but also to raise my own adrenaline. As soon as you turn around, they attack you. If you try to make eye contact, they get scared of you. 2:08 If you run, you’re prey. As soon as you turn around, they’re scared, they stop. 2:47 I think they’ve had enough, they’re too scared of me. I wonder if her techniques would work with people? "Lincoln" ~ Washington D.C. © 2011 Skip HuntJust got back from traveling a couple months in Mexico that I blogged HERE and editing photos from this trip HERE and now packing to leave again for D.C. and N.Y.C. for about 3 weeks in total. I was in D.C. to see one of my images displayed in the Smithsonian Castle last year and really enjoyed touring the galleries and driving around the Virginia countryside near my sister's place in Hamilton, VA. I just felt a bit rushed I guess. Welcome to the Jungle: Heading to Mexico in a couple of days. Not going on the motorcycle this time, but flying to the furthest airport from Austin, and then wandering my way back up North in which way I can. Most likely by bus, trains, hitchin', walking, Quien sabe? I'm excited to be heading back to the Yucatan because the last time I was there as before digital photography I think. Although, I recall going there sometime around 2000 to shoot some video of pink flamingos in Celestun, I must have been completely focussed on moving images because I don't have many recent stills. This time it's all about the experience and some experimenting. "Grandfather" ~ Zion National Park, Utah © 2011 Skip HuntBeautifully printed on 100% Cotton archival paper and displayed luxuriously bare at images from the book Skip Hunt :: Go West at House Wine in Austin, Texas. Prints are available for purchase and will be on display through August. A limited quantity of signed Go West books are also available for purchase at the counter. "Fine art photographer Skip Hunt of Austin, Texas traveled Westward via motorcycle in search of the exotic within the mundane. He found so much more! This issue contains the entire set of chronicles from Texas, New Mexico, Colorado, Utah, Nevada, California and Arizona. What began as a curious wandering with no particular path or direction, became a powerful life-changing adventure. Sometimes we must become lost before we can truly find our way." "As a lotus flower is born in water, grows in water and rises out of water to stand above it unsoiled, so I, born in the world, raised in the world having overcome the world, live unsoiled by the world"
~ The 5th Dimension :: "Age of Aquarius"
Once again, paralyzed with fear and indecision. Don't want to stay put rusting and it's known that travel creates a crisp awareness. But the fear is strong. It slithers up and asks in an acidic whisper, "Are you a fool?" "What will you do for money?" "Why can't you grow up and settle in?" "Why don't you just give up already?" "Do you really think anyone is interested in anything you have to show or say?" "What makes you think anyone wants what you have to share?" "Haven't you seen in the news how dangerous the world is lately?" "Do you really want to chance it?" Then a faint memory of late afternoon light passing through a moving bus window curtain glimmers. You can just barely catch a glance of a strangers eyes as you both stop... for just a moment and become the same within the chaos. You make out the shape and sound of foreign late-night street echo. You're alone and wild in the desert watching the sun set as a full moon rises. It happens this way every time. You know what you have to do, but once again you teeter at the precipice and gaze into the water below. Will it be ice cold? Will you slip and make your last mistake? Couldn't you just be just as content staying in the known? The fear is strong, but in an instant you're mercifully reminded of what it once felt like to be free... alive... and absolutely AWAKE! The idea of cellular memory makes me wonder if ALL cells hold some sort of memory. And perhaps an entire place can hold memory and or some sort of data? I've wondered this for a good while because of some experiences I've had from ingesting plants that gave me information that I have no clue where it came from. So obscure, yet accurate but with no evidence of how it had previous been learned. Did I ingest memory? Or was I just tuned into it briefly? This memory or data doesn't seem to be something you can put your finger on or point a microscope at, so if it exists beyond this speculation... I'm betting it lives in some kind of frequency. Not to get all "hippy" with it, but I think it's completely plausible. And if so, then it's seems equally plausible that focussed thought could use and or otherwise manipulate it. Last night, (or was it the night before last? I can't remember. The lazy days are already running into each other.) ;) I road my motorcycle down the road and into Port Isabel in search of an easy late-night cheeseburger. The street seemed darker than it should of been, but I paid little attention. Why is it that when I feel the most clear and believe myself getting closer to truth, I stop and ask, "Wouldn't a drink be nice about now?". Why not just stay in a state of focus instead of seeking to hide in an intoxicated fog? This time I managed to resist, but what is it about truth's edge that makes you try to dull it? Perhaps it's simply too cozy napping in the bliss of foggy ignorance. Road from Austin to Port Isabel yesterday. Spending a week chillin' & riding around South Padre island. Already burnt to a crisp from wind & sand, but I don't care. Just feelin' free.